Materials: 500 (550) 600 g light blue (col 358) quality "Assouan" (100% cotton, mt=110m/50 g) from ANNY BLATT. One pair 3 mm and 3 3/4 mm needles, one 3 mm circular needle INOX. Stst: K on Rs, P on Ws. G st: K all rows. Horizontal ribs: *4 rows stst, 10 rows g st, 6 rows stst, rep from *. Ajoure patt: number of sts multiple of 3. Only Rs rows are given, on Ws work sts as set P yo's. Rep patt g and rows 1-4. Cable (over 11 sts): work foll chart 2. 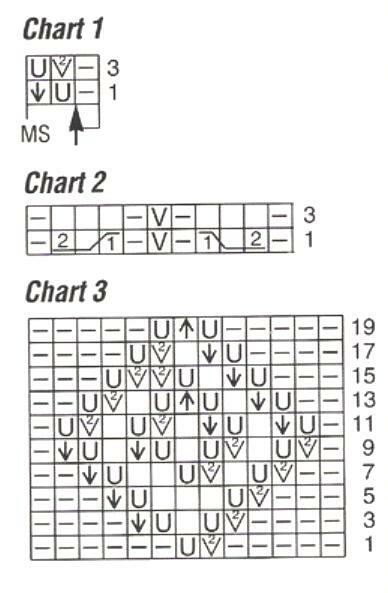 Only Rs rows are given, on Ws work sts as set or as given. Rep rows 1 - 4 for patt. 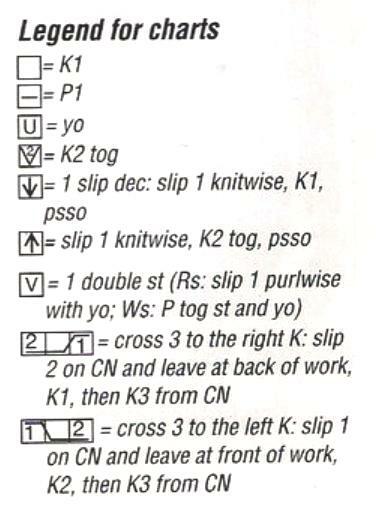 Eyelet diamonds (over 13 sts): work foll chart 3. Only Rs rows are given, on Ws work sts as set, P yo's. Rep rows 1 - 20 for patt. Average tension: 22 sts and 29 rows to 10 cm square. cast on 109 (121) 133 sts with 3 mm needles and K1 return row. This row is not counted in the foll calculation. Cont with 3 3/4 mm needles as foll: edge st 9 (15) 21 sts ajoure patt, 13 sts eyelet diamonds, 4 sts horizontal ribs, 6 sts ajoure patt, 11 sts cable, 4 sts horizontal ribs, 13 sts eyelet diamonds, 4 sts horizontal ribs, 11 sts cable, 6 sts ajoure patt, starting with sts from arrow, 4 sts horizontal ribs, 13 sts eyelet diamonds, 9 (15) 21 sts ajoure patt, starting with sts from arrow, edge st.
Wwm 35 cm = 102 rows cast off for armholes at each end of every alt row 4 sts once, 2 sts once and 1 st twice, then on 4th foil row 1 st once = 91 (103) 115 sts. Wwm 54 cm = 156 rows (56 cm = 162 rows) 58 cm = 168 rows cast off for neck the 29 (31) 33 centre sts and finish each side separately. At neck edge cast off on every alt row 3 sts once and 2 sts once. Wwm 56 cm = 162 rows (58 cm = 168 rows) 60 cm = 174 rows cast off rem 26 (31)36 shoulder sts. Front: proceed as given for back except neck. Wwm 48 cm = 140 rows (50 cm = 146 rows) 52 cm = 152 rows cast off the 13 (15) 17 centre sts. At neck edge cast off on every alt row 4 sts once, 3 sts once, 2 sts once and 1 st 3 times, then on 4th foll row 1 st once. cast on 45 (51) 57 sts with 3 mm needles and K1 return row. Cont with 3 3/4 mm needles as foll: edge st 0 (3) 6 sts ajoure patt, 11 sts cable, 4 sts horizontal ribs, 13 sts eyelet diamonds, 4 sts horizontal ribs, 11 sts cable, 0 (3) 6 sts ajoure patt. starting with sts from arrow, edge st.
Inc 1 st at each end of every 8th row 15 times (1 st on every 8th row 12 times and 1 st on every 6th row 4 times) 1 st alt on every 6th and 8th row 12 times and 1 st on every 6th row 6 times in ajoure patt = 75 (83) 93 sts. Wwm 43 cm = 126 rows cast off for sleeve top at each end of every alt row 4 sts once, 3 sts once. 2 sts twice, 1 st 6 times, 2 sts twice, 3 sts once and 4 sts twice. Wwm 54 cm = 156 rows cast off rem 11 (19) 29 sts. 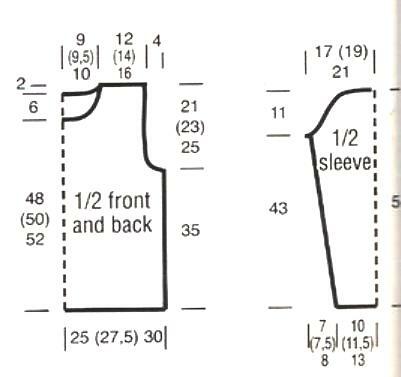 To make up: join shoulder seams. Round neck pick up with CN about 105 (109) 113 sts, P1 round, then cast off all sts knitwise. 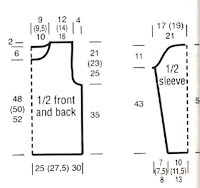 Sew sleeves in position, join side and sleeve seams.